When the house or apartment is occupied, we provide written information about what to do BEFORE our crew arrives. - Everything that can be removed must be taken out of the work area or covered; especially personal belongings, valuables or other items the occupant does not want dust to settle on during the reglazing work. - Vacate pets and people from the premises during the process and for four hours afterwards, especially if they have respiratory sensitivity issues or concerns about the fumes and dust caused by our work. - You can see full details in our Instructions page. First, we install a portable ducted ventilation system that we bring to the jobsite to expel the spray fumes to the outdoors and ensure a clean flow of air into the work area. Then we thoroughly tarp the traffic areas and other areas not worked on in the room to protect them from overspray. This is a very important step that ensures proper bonding of the new surface to the fixture being reglazed. 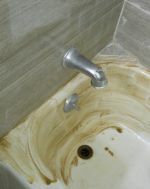 The fixture is thoroughly cleaned of all contaminants: wax, soap, grease, and water mineral build up. Silicone caulk is removed from the fixture as it does not allow the glaze coating to stick. Further cleaning is done with sanding and an acid wash to additionally etch the surfaces where this is needed and where it is possible. This step will de-gloss the original surface making it porous so as to create a physical or mechanical bond that allows the adhesion of the new coat. 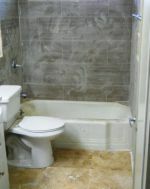 Our company uses a top-grade solution that will not damage faucets, other metal fixtures, or the septic system pipes. This will require different approaches, depending on the size of the damage and type of surface. Wherever there are chips, cracks, cave-ins, weak spots, etc., they are fixed so that the surface recovers integrity of function and durability. We do this with the proper materials and techniques that are in keeping with the original manufacture of the fixture. 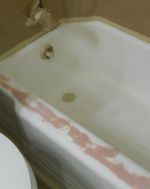 For instance, a porcelain finish over a cast iron bathtub is repaired like the body of a car. 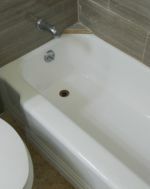 A fiberglass bathtub, however, is repaired like the body of a plastic or fiberglass boat. A special bonding primer is applied by hand to ensure strong adhesion between the clean fixture’s surface and the finishing substances that will be sprayed on. 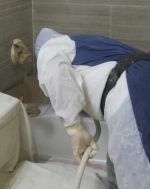 Then we cover flooring and other nearby surfaces with tarps, masking tape and paper to protect them from overspray. The finish is made of several coats of a catalytic mixture of reglazing substances that are specifically formulated just for reglazing. This is sprayed onto the surface of the fixture in the color chosen by the customer. The material is applied unadulterated and undiluted with a high volume / low pressure spray system. With training and extensive experience a technician acquires the skill to spray evenly, resulting in a drip-free and evenly coated surface. This surface is smooth and shining. It looks and feels much like the original.